The perfect small Christmas gift. This bookmark and pen set is a beautiful reminder of what the Christmas season is all about. Want a gift to encourage Bible reading this Chirstmas? With a bookmark and pen, this handsome set is a great reading aid. Pen & matching bookmark are packaged in acrylic packaging, Wrapped and Ready to give! "Yea, Lord, we greet thee, Born this happy morning; Jesus to thee be the glory giv'n! "Unto you is born this day in the city of David a Saviour, which is Christ the Lord. Luke 2:11"
Bookmark measures 1-1/2" x 5-7/8". Pen measures 5-1/2" in length and has black ink. 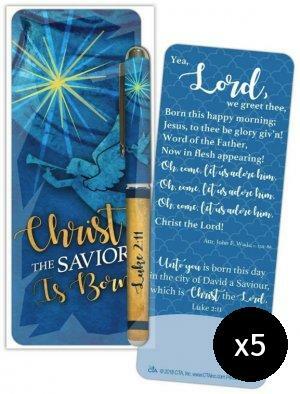 Christ the Savior is Born Bookmark and Pen Set - Pack of 5 by CTA was published by Eden bundles in November 2018 and is our 24435th best seller. The ISBN for Christ the Savior is Born Bookmark and Pen Set - Pack of 5 is EDENBUNDLE-2244. Be the first to review Christ the Savior is Born Bookmark and Pen Set - Pack of 5! Got a question? No problem! Just click here to ask us about Christ the Savior is Born Bookmark and Pen Set - Pack of 5.